This summer I read Watership Down with Andrea and Dad. I would give this book 9 out of 10! I wrote this as an extra-credit assignment for sixth grade. It took a while. I had a lot of fun reading the book. I’m a little nervous to read this book because it’s about rabbits and I like action. So far however I think it seems like there are police in the warren (community of rabbits in a group of rabbit holes) and police means fighting, which is awesome because that means these rabbits aren't only the cute and cuddly harmless little things some people pretend they are. The first character I meet is Hazel who I’m guessing is the main character and hero of the story based on his adventurism, leadership, the fact that he doesn't stand out and that he is extremely nice and protective of a small rabbit he’s best friends with named Fiver. Fiver is a very queer character who seems strangely impulsive and fast mentally, for a weak bullied “runt.” (In rabbit culture it is said that the first four rabbits in a litter are all perfect hence the name Five-r.) I think that Fiver is probably some sort of foreseer because he knew that something bad was going to happen when a construction sign was put down close by the warren. I told dad that Hazel and Fiver where probably going to save the warren from destruction and now Hazel and Fiver are going to the chief rabbit to recommend evacuation. The old stubborn Chief rabbit doesn't listen. Hazel meets Bigwig, a member of the Owsla (warren police) who agrees with Fiver and decides to help them get as many rabbits as possible out of the warren. I am happy that he is on their side. In the end Hazel leads Fiver, his brother; Bigwig, a straightforward warrior; Blackberry, an extremely smart rabbit; Dandelion, the storyteller; Pipkin, a rabbit smaller than Fiver who is shy but loyal to his friends; Silver, a friend and follower of Bigwig, Buckthorn, your average Joe; Hawkbit, a distrustful small rabbit; Speedwell, a smaller quick rabbit; and Acorn, a discontented rabbit who’s friends with Speedwell. I think that we're in for a pioneering adventure story of a band of vagabond rabbits. It’s Ironic that the reason these rabbits started off so early is because Captain Holly came with orders from the Threarah to bring the company back to the warren at which the rabbits fled. After a while of traveling the rabbits come upon a wood. The rabbits start to lose their courage and I just know something bad is going to happen. So Hazel has Dandelion tell a story. 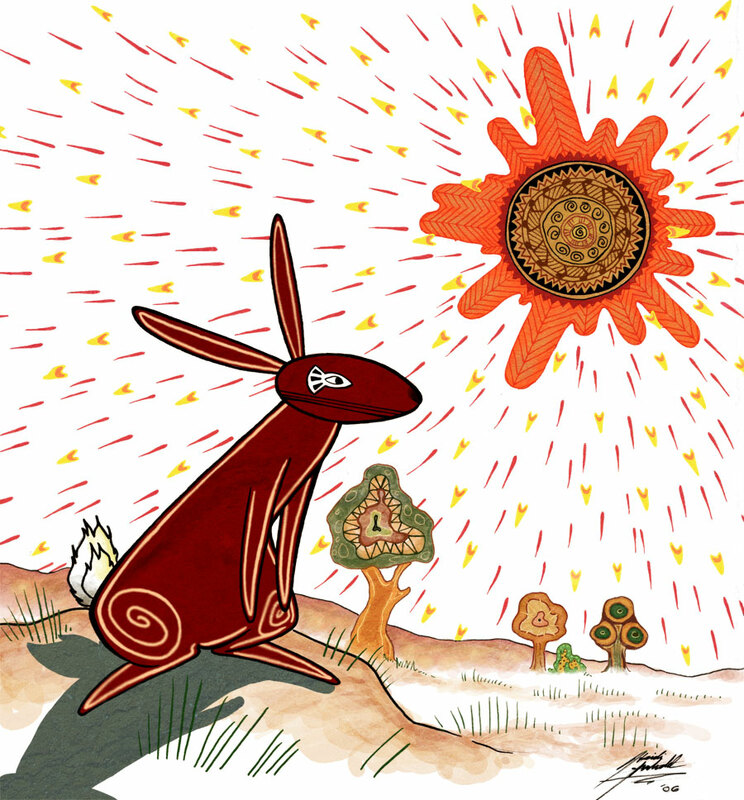 I am surprised to hear a biblical story of El-Ahrairah (the first rabbit) and Frith (god; the sun). In this story, because of El-Ahrairah’s arrogance Frith gives lots of animals the desire to hunt and kill rabbit, and the ability to do so, and in return El-Ahrairah becomes faster than any of the animals, clever, and tricky. Frith says to El-Ahrairah “The entire world will be your enemy, Prince with a Thousand Enemies, and whenever they catch you, they will kill you. But first, they must catch you, digger, listener, runner, prince with the swift warning. Be cunning and full of tricks and your people shall never be destroyed.” This is very interesting how the rabbits have there own religion. And now at the end of this inspiring tale a badger bursts in on them. 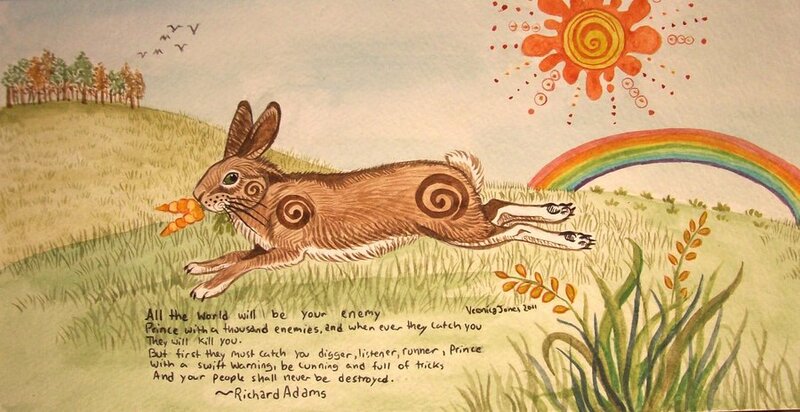 I am very scared now for the rabbits as they dash away from the badger. Finally they come upon a river that fiver says they must cross, maybe on the other side is food or something. Blackberry comes up with the idea of rafting Pipkin and Fiver across which totally blows the other rabbits away. This seems a little fictional, but so are a lot of other things so far, from the Owsla to the rabbits having names. The rabbits make it across the river and in addition pass a field and decide to start digging a new warren in an empty patch of land by a farmer's barn. I was totally startled when I read about a strange rabbit coming over the field, after a very uncomfortable night in their dusty, incomplete holes. Hazel and Blackberry find out that this rabbit named Cowslip is from a warren on the other side of the field. I think that Cowslip is probably going to try to report the rabbits to the Sandleford warren if they hear their story. Hazel and company decide to spend the night with Cowslip and his warren. I can tell from the way the author describes this warren as somber and sad that something is up. Fiver’s spider sense is tingling and he refuses to sleep in the warren and spends all night under a yew tree. Something must be seriously wrong, on the other hand, the rabbits from Cowslip’s warren, recite poems, have sculptures, and store food; how bad can they be. One evening Dandelion tells the story of El-Ahrairah and the Kings Lettuce. I really enjoy these stories. When El-Ahrairah needs food to survive he disguises himself and convinces the King that the lettuces contain a virus and that he should give them to the rabbits so that the rabbits die. Shockingly the Cowslip warren rabbits seem like they don’t like the story. They have a Poet named Silverweed say a poem about loneliness at which fiver shivers and then dashes out of the warren. Hazel and Bigwig go out after him and for the first time listen to what he has to say about the warren. Bigwig says that he is through with Fiver and that he is going back to the warren to stay with the others. This is intense. Hazel and Fiver hear a scuffling and scraping and find Bigwig caught in a snare. So that’s why the rabbits are so somber. Fiver goes to Cowslip's warren to get them to help, all the rabbits from Sandleford come, but Cowslip tries to hurt Fiver and tells him to be quite. After a very emotional time when it seemed like Bigwig was dead and dad was crying, he came back and wanted to kill Cowslip. I don’t blame him. Fiver said “Once upon a time a farmer was taking care of a warren and at the same time snaring them for meat. The rabbits became strange in many ways, different from other rabbits. They knew well enough what was happening. But even to themselves they pretended that all was well, for the food was good, they were protected, they had nothing to fear but the one fear; and that struck here and there, never enough at a time to drive them away. They forgot the ways of wild rabbits. They forgot El-Ahrairah, for what use had they for tricks and cunning, living in the enemy's warren and paying his price?" And so on Fiver’s advice and the devastation to Bigwig the company sets out again. Strawberry, one of the rabbits from Cowslip’s warren comes to join them. Now I feel more connected with the characters and care about them more. After a long while of traveling the rabbits finally come upon a down and build a warren. Using Strawberry’s idea to build the warren under a tree, the rabbits created a main hall which would have caved in otherwise. Strawberry’s cleverness will probably land him close with Blackberry. While the warren goes scouting out the edge of the down they come upon a rabbit that at first they think to be The Black Rabbit of Inle (the angel of death), but who turns out to be Captain Holly of the Owsla. How and why, are my first thoughts? I think that Holly is a very complex character. Hazel takes Holly and his companion Bluebell to Watership Down which is what they decided to name their warren. And so Holly begins his story of reaching them. I can’t wait to hear what happened. Captain Holly had gone as far as the river before calling off the search for Bigwig. Holly was passing hraka (going to the bathroom) along with Bluebell so they saw men come. The men started putting together contraptions, which sprayed out some stuff that was making the rabbits in the warren go nuts. Then “a hrududu (hrududu means a man thing that moves) came and tore the warren, rabbits and all to bits” (this hrududu is a bulldozer). He and Bluebell had traveled all the way to Cowslip’s warren where they were chased away until they came to the down. I can’t believe it. So Fiver was right and the Threarah was wrong, and now Captain Holly has come and apologized. It looks like they will be happy ever after. Dandelion tells story of The Trial of El-Ahrairah, where a mole is sent to make sure that El-Ahrairah doesn't cause any mischief. 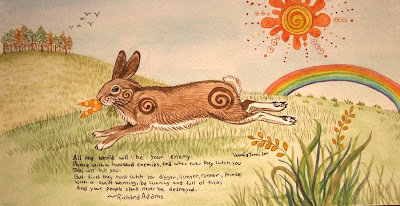 When El-Ahrairah wants to steal some carrots he makes some rabbits dress up as different animals and do strange things so when Prince Rainbow took El-Ahrairah to court, they ruled that the mole was totally out of his mind because of all of the crazy things he had said happened. These tales probably inspire the rabbits to be who they are. ­Later on Bigwig found an injured seagull that the warren rehabilitated. This is probably the most unheard of thing in the whole book. The seagull named Kehaar (the name means the sound that the waves make) heard that the warren was looking for does. Kehaar went out and reported to Hazel that there are hutch-does at a farm nearby and that a few miles east there is a large warren. This is probably going to be a problem later on. I think that Bigwig can relate with me in wanting to fly. Holly, Silver, Buckthorn, and Strawberry set off for the new warren to negotiate a deal for does. Hazel suddenly feels mischievous and goes of with Pipkin to the farm. At the farm Hazel explains to the four hutch-rabbits what wildlife is like and finally leaves on the terms of further meetings and an eventual breakout. When Hazel brings back the news he brings along a group of rabbits to get the hutch-rabbits out. When Fiver warns Hazel not to go on the journey, Hazel promises only to go as far as the gate. I wonder what Fiver is foreseeing, and why Hazel doesn't trust him. I hope that if I were Hazel I would have trusted Fiver about the Sandleford warren in the first place. The rabbits successfully invade the farm, take the four rabbits with them, but they can only bring back three. On the way home men come and everyone scatters. Hazel, trying to save a doe, runs out to distract the men and gets shot in the thigh. The company continues taking the rabbits back to Watership Down. I don’t think Hazel died,because he’s just too important to the story to die right in the middle. Soon after, Fiver and Dandelion go looking for Hazel, who is barely breathing inside a ditch. Whew! They take him back to the warren to recover. Holly and the rest come back from their adventure with no does. All in all, the rabbits aren't doing so well. I’m very curious to hear what happened to Holly and the others. Holly begins his story. They rabbits had journeyed to Efrafa which they found out is the name of the warren. They were taken away by some very strong rabbits and placed in a burrow. They found out from Hyzenthlay and other does in Efrafa that the Chief Rabbit had created a monarchy that was divided into three divisions called marks so that the officials could see who was in what mark so that they knew where you were supposed to be. The Efrafans would bite you and where they bit you determined your mark. 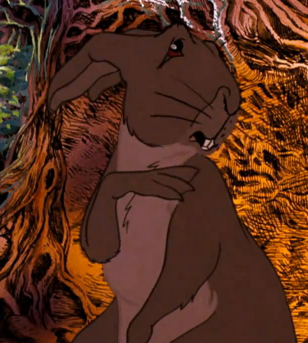 Under General Woundwort (the chief rabbit) was a Council. Each member advised Woundwort on concealment and control. Under Woundwort and his council were the captains of the marks, which each had a mark they were assigned to control. They were helped by officers, sentries, and owsla. This doesn't sound like a friendly warren. After hearing this Holly and his band were sent to General Woundwort and the council for an introduction to what it will be like for them in Efrafa. When Holly asks about taking does back to Watership Down, Woundwort says that they won’t be going back much less taking does with them. So later that day, Holly, Silver, Buckthorn and Strawberry decided that they couldn’t convince Woundwort to let them take does, so they ran away. I was totally consumed with anger when I heard that the Efrafans, being the stronger, faster, more experienced rabbits, were gaining on them. And suddenly out of nowhere comes an agent of Frith, making a methodical boom with red and white lights flashing. The Efrafans were run over by a train. That was a funny part of this book. Hazel decides that the rabbits must have does and that they can’t do this by force, or by surprise, so they must devise a trick. Blackberry whispers something to Hazel and they decide what they will do. I hate it when the reader isn’t in on the plan. And so, for the second time a party of ten sets off for Efrafa. Will they get the does? This is probably a very important part of the story. Out of all ten rabbits only Bigwig goes into Efrafa. Once inside he pretends to be a wanderer, and is made an officer right away. He finds Hyzenthlay and puts together a party of ten does as well as Blackavar, a bullied Efrafan rebel. I think that Hyzenthlay and Bigwig will mate once the time comes. It all comes down to this moment. I think that it's possible that Kehaar could fly the does to Watership Down one by one, but I doubt it though. The ten does are waiting in the fields pretending to eat and Bigwig frees Blackavar and runs to the river where Hazel and the others are waiting on a boat. 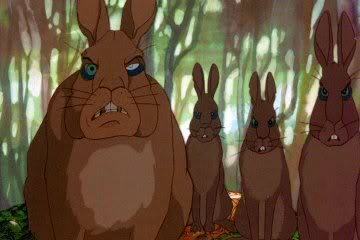 The does and Blackavar aren't far behind Bigwig, and Woundwort is behind them. Everyone gets on board the boat, and Woundwort, coming to fight, is left to wonder as the boat speeds down the river in the current. Mission Accomplished. I remember talking about what has happened so far and how I like the book so far. That was totally awesome. Bigwig has a price on his head though. I wonder if Hazel will decide to travel further than their home warren. In my mind there's no doubt that there will be further confrontation between Watership Down rabbits and the Efrafans. After a whole bunch of worried and tired rabbits wander home, its time for a story. The story is called El-Ahrairah and Rowsby Woof. El-Ahrairah and Rabscuttle trick a ratter dog named Rowsby woof into waiting for the queen to award him official ratter. Meanwhile El-Ahrairah and Rabscuttle exported all the lettuces that the dog was supposed to be guarding. And at the end of a perfectly good story a mouse they befriended comes and informs them that a large amount of rabbits are right outside Watership Down. Holly and Blackavar go to check them out and stamp (stamping is a signal used to warn that there is danger). Everyone runs underground. Holly reports that they came face to face with Campion and know that Woundwort and two dozen other rabbits are with him. And so, it is time for the final matchup between Watership Down and Efrafa. Hazel tells Bigwig that he should block up all the runs except Kehaar’s and that he is going to the general. I doubt that he will die, but mature books don’t follow the same plot average fiction does. 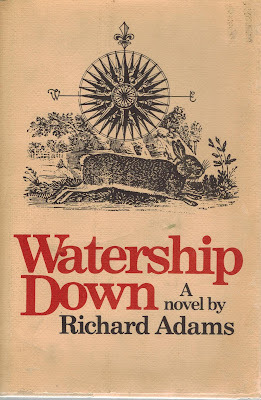 Hazel goes to Woundwort and proposes creating a warren in between Watership Down and Efrafa so that neither warren gets too crowded and as a symbol of peace. Unsurprisingly, Woundwort replies “No, and the only reason I won’t kill you is because I want Bigwig to know I said that.” This means war. Hazel says El-Ahrairah has spoke to him, and that he knows what he needs to do. He takes Dandelion and Blackberry to Nuthanger farm. I have no idea what they're going to do. Meanwhile, Fiver goes into a trance and Bigwig, after getting everyone inside the mating burrows, and realizing that Woundwort plans to deploy his forces through a hole he is impolitely digging through the roof, realizes he will dig a hole and cover himself and when Woundwort comes he will spring out from underneath Woundwort. Hazel, Dandelion, and Blackberry reach Nuthanger farm. 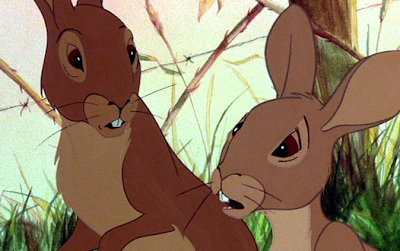 Hazel tells Dandelion that he will cut the dog loose and that Dandelion must run (leading the dog) to Blackberry who must bait the dog to Watership Down. But will the dog get there in time? Woundwort gathers his forces together and jumps on the hole his Owsla had been digging. The roof falls away. He finds that he is in no danger but hears a scuffling behind a loosely blocked run. He brings in some troops and digs out the rabbits. I can’t bare the excitement. Hazel is knocked on his side by a cat from the farm. Woundwort walks into the run. Dandelion reaches Blackberry, with the dog thirty yards beyond. A girl comes and makes the cat get off Hazel. What’s going to happen? Woundwort takes another step forward and Bigwig takes a bite out of his rear leg. They begin brawling, but Woundwort, used to his opponents going down quick, has to go outside and take a break. Blackberry arrives at Watership Down with the dog and everyone bolts. Except for Woundwort who cries out “get back here you fools, dogs aren't dangerous”. Hazel has to move far out of his way back to avoid being chased by the dog, which walks back home licking the blood off his paws. IT WORKED! The rabbits are saved. Campion rules Efrafa, and with Hazel creates the cross warren Hazel had proposed. All three warrens prosper and Hazel lives a life much longer than most rabbits. After a contented life he sees a visitor with a black back walk into his burrow unnoticed. He says that Hazel’s time is done and that now he may join his Owsla. My Dad starts crying. Before departing he hears a doe tell her child. Once upon a time El-Ahrairah and Rabscuttle went out for a walk, they came across a sign and Rabscuttle told El-Ahrairah that the sign had a curse, and so El-Ahrairah left the warren with a few of his advisors and came to a new warren and Rabscuttle showed El-Ahrairah that there was a curse that lay on this warren and so they left. And then El-Ahrairah and his advisors built a new warren. They were attacked by a Bad Rabbit, but Frith came and told El-Ahrairah to use the animals. And so from a fox he found stealth, from a mouse he found wisdom, from a bird observation, and from a dog courage and so El-Ahrairah was happy.